Nietzsche always insists on being in the photo. He just wants to be included. The rice stitch is a nice alternative to a waffle stitch. It gives a good texture, but it's something a little different. I love it when I can memorize a stitch pattern and not think about it too hard. 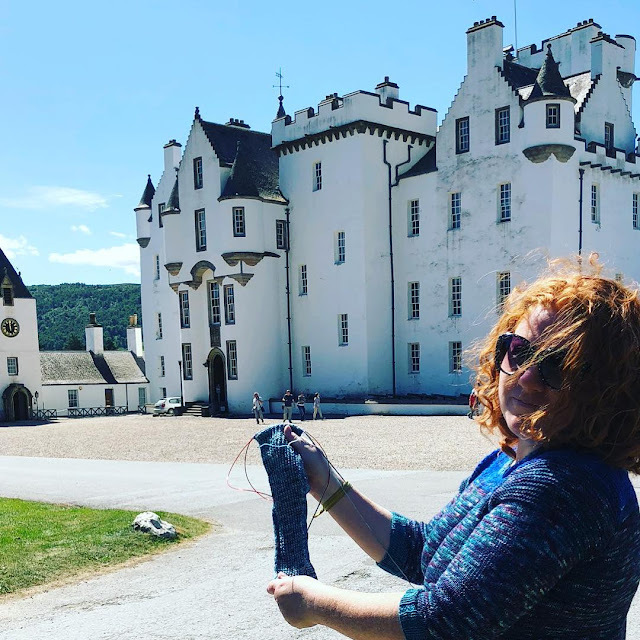 Here's me working on the sock in front of Blair Castle in Scotland. (Pardon my wind-blown hair.) Victoria was filmed here, and there was an awesome exhibit of costumes from the show. Lucky! I'm wearing my No-Fade So Faded Sweater, too.